How Does Sensory Play Work? Sensory play helps stimulate all senses: touch, smell, taste, sight and hearing—even balance (vestibular) and body awareness (proprioception). Sensory play based activities help children explore all of their senses and can get them interested in the world around them. Not only does it help to stimulate the senses, but it can also help in language stimulation. Offering your child the chance to play with different types of textures and objects can help them find new ways to talk about the world around them. Providing language stimulation in a meaningful context and creating meaningful learning opportunities is crucial for early language development. Sensory play based activities allow children to interact socially, pretend play, and expand their vocabulary. It’s beneficial for all children. Edible Sensory Play Balls – The Mud Kitchen has a great step-by-step guide to making edible sensory balls with your child. A sticky, messy, yum-fest your child is going to love this. Really the photos alone from this activity are going to make this totally worth it. 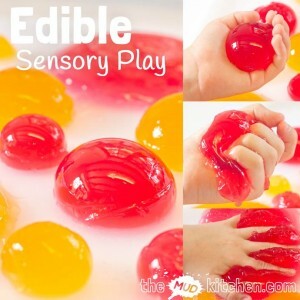 This multi-sensory play activity easy to do and yummy! This activity focuses on: touch, smell, taste, and sight. Gone Mudding! – Stir the Wonder has great ideas for inspiring learning through play. Her post on Clean mud sensory dough does not disappoint. If your child likes to play with monster trucks or in the mud, this activity is perfect to try at home. The link also gives you a list of a few books you can read to your child before you begin the activity—rev up those imaginations! This activity focuses on: touch, smell, and sight. Jumping Lines – Have an active child? If so, this gross motor sensory input activity is great for those days when the weather is bad. It’s also great for children with ADHD who can’t sit still and need to move around. Spoiler alert: you won’t believe how many clever ways there are to arrange tape on your floor. Senses the activity focuses on: balance, body awareness and sight.